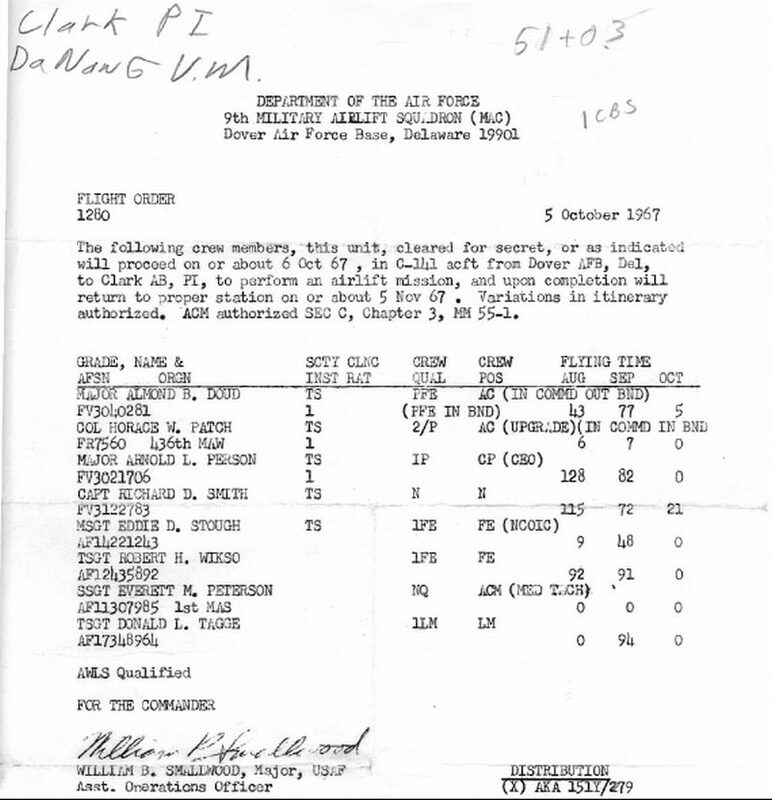 Here's a leg by leg account of a Viet-Nam ara mission flown from Dover AFB, Delaware to Da Nang Viet Nam in October, 1967. The crews flying missions to Viet Nam staged at different locations and went into crew rest after each leg of the mission. The aircraft continued with a staged crew and made the round trip from Dover AFB to Viet Nam and back to Dover in an average of 45 flying hours, while the the crews made the trip in five days or more deponding on the length of crew rest and the specific routing they ended up taking. 07 October 67: Land at Elmendorf AFB, Alaska at 052SZ hr. (7+59 flying Time) Crew rest at Elmendorf. 08 October 67: Take off from Elmendorf at 0719Z hr. (Tail #271, Charleston AFB aircraft). Land at Yakota AFB, Japan at 1619Z hr (9+0 flying Time) Enter crew rest. 10 October 67; Take off from Clark at 0233Z hr. (Tail #265). Land at Yakota AFB, Japan at 0705Z hr. (flying tune 3+42) Crew rest at Yakota. 13 October 67: Land at Elmendorf AFB, Alaska at 081OZ hr. (8+50 flying Time) Crew rest at Elmendorf. 14 October 67: Take off from Elmendorf at 0324Z hr. (Tail # 642) Land at Dover AFB at 1032Z hr. (7+08 flying time) Total flying time for the mission was 51+03 and one (1) Combat Sortie. I had three days crew rest at home and then back to the Flight Engineers scheduling desk, scheduling Engineers for world wide missions similar to this one.